Posted on November 15, 2005 by Mark A. 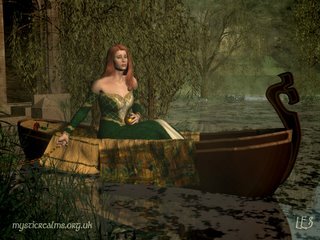 For some inexplicable reason the past few weeks I’ve been obsessed with “The Lady of Shalott” by Tennyson. I love the way Tennyson manages to create the sense of the pastoral and the elegiac simultaneously in the poem: The beauty of Camelot; the isolation of Shalott; the Platonic notions of reality; the agency to overcome fate. I find the images of the cracking mirror and the inclement weather at the end of the poem particularly powerful. Go here to read the poem. Loreena McKennitt sings an abridged version of the poem on her album “The Visit.” I love the way she sings the poem, and every time I read it I hear McKennitt’s voice in my head instead of my own, which isn’t a bad thing. Go here to watch a video of McKennit perform the song. If you’ve never heard Loreena McKennitt I would highly recommend buying one of her CD’s. The Visit and The Book of Secrets are my favorites, but all of her CD’s are well worth owning. Good writing music.